03/04/2018 - Added a new profile template (finALLY)!!! Spice up your hype with Kingdom Hearts and as a bonus, 2 types of info boxes were remade! One of which is your standard, Keyblade wielder/general OC type while the other is for your Organization XIII baes! A. Do you want me to work on a new profile? B. Maybe just add in a new color scheme to match with the FFXV wiki? C. Perhaps the WIP separate page tab for a more coherent DLC section for your babs? Hello! This is Erandia and recently, I've been coding some wiki-style character profiles for my friends after I've done a base/template code for one of my OCs. So, I decided to upload some of these here so anyone else can use them! These are all HTML compatible so non-premium users can also use them without a fail! These templates were all derived from the same base/source code-- the Watch_Dogs one in particular. If it is similar in structure or form to someone else's code WITHOUT my credit at the bottom, these are ALL just coincidences. I built the WD profile from scratch and all the other templates follow it, and nothing elses'. It may be similar because, well, it's based on the wiki pages lmao the concept itself isn't even original. Franken-editing/tweaking the code/mish-mashing/generally editing and fixing and what not is OKAY! What is NOT okay, however, is redistributing, erasing the credits, claiming as your own, basically stealing and pretending you did everythng from scratch. I've noticed a few people who have apparently not seen the rules I put up earlier and ignored my comments on the profile proper and so, either deleted those and or haven't given credit properly, soooooo ¯\_(ツ)_/¯ I'd appreciate it if you guys see incidents like these and report/tell me or my friends! Using them for your other OCs! Commenting here your own work/OCs! Do NOT (and I mean it) sell these. They are FOR FREE and anyone asking for a fee/selling these to you is a SCAM and RIPOFF and please report them/tell me asap! If you are experiencing troubles using/editing/fixing your profiles using this template, feel free to shoot me a PM or comment on the thread! I may not reply ASAP but I DO read them during my spare time in Uni! That said, please check out the profiles on the table to the right~! Thank you for using them and I am always interested in seeing other people's character profiles! Feel free to comment here if you used them! And uhh, completely optional but if you guys loved my work, any tips on my dA is certainly appreciated! Even one point will do me a favor! But like I said, these are optional! 1. 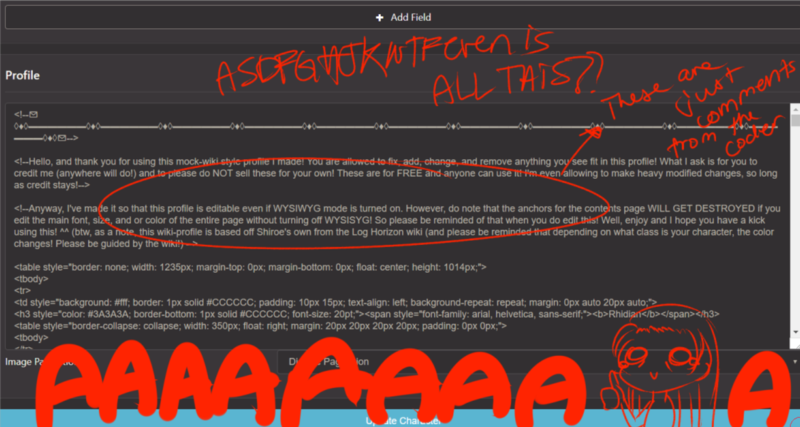 First thing's first, WYSIWYG should be turned off for you to copy and paste the code in the raw text editor! You can also check if it's turned off if you see just the raw code in whatever character you are planning to edit! DOOOOON'T PANIC YET! JUST IGNORE ALL THOSE FANCY SCHMANCY LESS THAN SIGNS AND GREATER THAN SIGNS FOR NOW! There's only a few things you need to keep in mind so don't worry if it's all jargon to you! 3. ANY VARIATIONS OF LATIN PLACE HOLDERS!!! 1. <table style="border: none; width: 1235px; margin-top: 0px; margin-bottom: 0px; float: center; height: 1014px;"> Basically, you don't really need the entire thing. You just gotta check the width. The rule of the thumb is: If you see a scroll bar on your bottom/if a horizontal scroll bar appears, then you need to adjust it manually to fit with your screen resolution. 1235 works for MY screen, but it wont necessarily be the same on your end! What's the right number? I have no clue! >u< b Okay in all seriousness, you just gotta do trial and error, maybe go down via 5 pixels like, if 1235 doesn't work, try 1230 then 1225 and so on. The code there is just setting how big the entire profile will be. But if you're a nitpicker (like me!) then certain things irk you and most likely, the profile not fitting in your screen is one of it. 2. This one is pretty self-explanatory. I deliberately added "//INSERT HERE INFO//" as a really obnoxious placeholder to attract attention and not let people get swallowed by the sea of codes and jargon. Just ctrl + F and ignore everything else and add in whatever info you need! This is actually just the raw code for adding in links! You need them to locate where you have to add in the links for image galleries, clickable images, etc. Just replace the "/" between the two quotes with the link you need! This one is for the images! Normally, I'd put placeholder images on the link part and that's what you need to replace! (Remember, it has to be a direct link!) The width and height could be adjusted to your tastes, but I usually just follow the wiki standards. And that's usually it! Literally, with just that, there's nothing to else to change and whatnot! I've always put in reminders on each code as comments and whatnot, so please do remember to read it as well! For any other things you want to change (color, BG, etc) that usually required just finding the hexadecimal numbers (things with #000000 or any combination of numbers and letters) But like I said, even when you have no idea what the hell are all these huge fricking jargons are, if you know what to look for, then there's nothing to fear! I wish you luck and for any other concerns, just leave a comment on the thread and I'll try my best to help! //and if not, because srsly I'm a really newb coder, then maybe some of the veterans will help out! ONCE AGAIN, THIS GUIDE IS FOR THOSE WHO ARE SERIOUSLY TOO AFRAID TO TOUCH THE RAW CODE/TURN OFF WYSIWYG BUT WANT TO TRY OUT SOME CUSTOM PROFILES! THIS IS NOT MEANT FOR THOSE WHO ARE SEASONED PROFILE EDITORS!!! //I might do image mapping one day because I can't figure out the image hovering (or was that only CSS) if I ever find extra time ahaHHAH thank you so much btw! Haha omg! I had been working on one of these to give-out as freebies but always been to lazy to get around finishing it but I think you got it down just right! Fuwa's hard work shines! ;u; I LOVE her profiles! No, no! It's really okay. ; u; I sure as heck wouldn't have been able to notice/tell, if you didn't! I'm just glad you don't mind me as I keep messing with Emi's profile and adding in things to it, while experimenting with things.